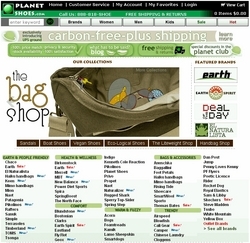 Planet Shoes, partnering with CarbonFund.org, now offers CarbonFree Plus Shipping as an option for consumers buying shoes and products online at PlanetShoes.com. Planet Shoes will purchase the carbon offsets equivalent to the environmental impact of the shipping materials and transport for customers. Planet Shoes is now offering CarbonFree Plus Shipping as an option for consumers buying products and shoes online at PlanetShoes.com. Partnering with Carbonfund.org, Planet Shoes will purchase the carbon offsets equivalent to the environmental impact of the shipping materials and transport for customers who voluntarily choose the "CarbonFree Plus" shipping option. While reducing energy consumption begins with individual lifestyle choices and behaviors, many people are also investing in carbon offsets as an alternative method of working towards reducing the effects of climate change. Carbon offsets are calculated by taking your energy consumption into account, and coming up with a dollar figure that you can then invest in alternative energy projects and technologies to "offset" the energy you use and the CO2 you emit. "Planet Shoes is passionate about the environment. We carry environmentally friendly shoes, including Earth Shoes, and likewise we want to find ways to 'green' our business processes. We're already participating in a number of green programs, including encouraging ride share with NuRide.com and 1% For The Planet. When we learned about the option of purchasing carbon offsets to lower the carbon footprint of shipping materials and transport, we seized the opportunity. This is a program where we can literally partner with our customers to improve the environment," said Barry Bresnick, Executive Vice President of Planet, Inc.
As online shopping grows in popularity, so does the concern about the environmental impact of the shipping vehicles and materials. Companies nationwide are looking at ways to "go green" without compromising on the quality of their protective packaging or on the speed and efficiency with which their products are delivered. Planet Shoes is committed to finding this balance. Using the Carbon Calculator on Carbonfund.org, you can determine the carbon footprint of yourself, your household, or even your wedding. PlanetShoes.com uses the Carbon Calculator to deduce the carbon footprint of shipping each specific package that is ordered through their site. For a small additional fee, typically between $1.01 and $1.75 depending on the weight of the package and the distance it needs to travel, Planet Shoes customers can contribute to the purchase of carbon offsets. Planet Shoes will pool the individual consumer investments and purchase carbon offsets in bulk in order to offset the environmental impact created in shipping their shoes or other products. This option is available to the vast majority of customers who would normally qualify for free ground shipping within the continental US. "When you're talking about carbon footprints, what better partner than an online shoe company," said Eric Carlson, Executive Director at Carbonfund.org. "Planet Shoes is looking out for the planet by ensuring that the only footprint you leave behind is the one from your stylish new shoes, and not from your carbon impact. We are so pleased that Planet Shoes is stepping forward to take a leadership position in protecting our environment." "Not everyone has the means to implement clean energy technology in their home, or even to substantially reduce their gas and oil consumption, at least not to the point where they could make a profound individual impact," continued Bresnick. "By helping our customers to purchase carbon offsets, we feel like we're making a difference and helping our customers to do the same, in a very painless way. If we all work together, we can combat environmental damage and can use business ethics to further the environmental cause." Carbonfund.org is one of the country's leading carbon reduction and offset organizations, making it easy and affordable for individuals, businesses and organizations to reduce their climate impact. Carbon offsets enable individuals and businesses to reduce carbon dioxide emissions they are responsible for in their everyday lives by supporting high-quality verified renewable energy, energy efficiency and reforestation projects. Carbonfund.org works with over 400 corporate and non-profit partners including Discovery, Volkswagen, Dell, Orbitz, Environmental Defense, and Lancôme. Planet Shoes, on the web at PlanetShoes.com, is a family owned business dedicated to selling the most comfortable shoes possible at value prices. We specialize in Active, Comfortable, Healthy, Earth Friendly products with a flare of Fashion. Our product lines are ever-expanding to bring our customer new fun footwear to choose from. We look at affordability and value in pricing our products. Customer service and unique products are our calling card. Planet Shoes strives to exceed your expectations. Contact us directly at 1-888-818-SHOE (7463) or via e-mail info @ planetshoes.com.